1931. 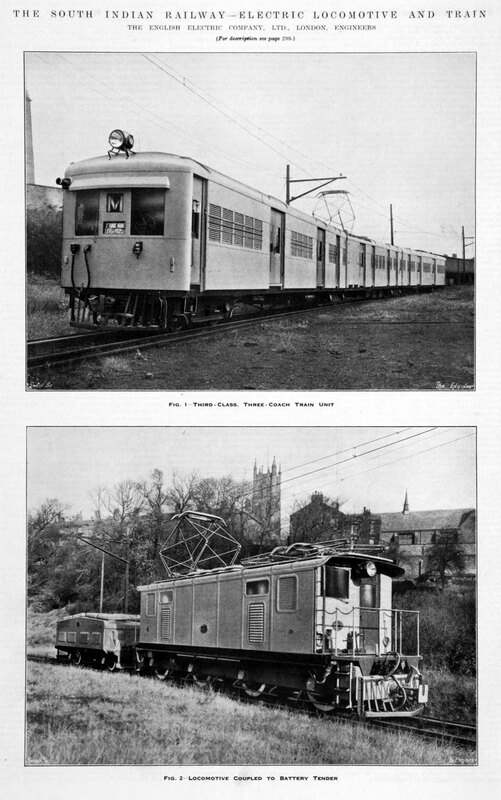 Electric Locomotive and Train - English Electric Co, Engineers. The South Indian Railway Company was a railway company which operated in South India from 1874 to 1951. 1853 The Great Southern of India Railway Company was established with its headquarters in England in 1853. The Carnatic Railway Company was founded in 1869. 1890 The new firm was registered in London with Trichinopoly as its headquarters. 1891 The Pondicherry Railway (incorporation in 1845) merged with the South Indian Railway Company. The company moved its headquarters to Madurai and later, Chennai Central. The company operated a suburban electric train service for Madras city from May 1931 onwards. 1944 The South Indian Railway was nationalised. On 1 April 1951, the South Indian Railway, the Madras and Southern Mahratta Railway and the Mysore State Railway were merged to form the Southern Railway zone of the Indian Railways. This page was last edited on 9 March 2015, at 06:11.